I first stepped into politics as a concerned citizen in February 2013 when I was nearly 30-years-old. I argued before the Phoenix City Council to support an Anti-Discrimination measure to include protections for members of the LGBT and disability communities in city contracts, housing, employment and public accommodations. 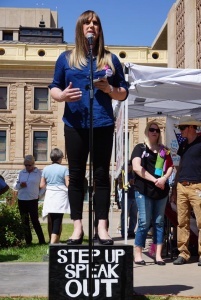 Two months later I argued against AZ Senate Bill 1432, aimed at prosecuting transgender people for not using the public restroom matching the gender they were assigned at birth. I opposed the bill because it was discriminatory; I understood its ramifications because, in the fall of 1984, I was born a boy. My parents dropped out of high school when I was born, and both abused drugs so that they couldn’t care for themselves, much less a child. Through the years, they rode the roller-coaster through episodes of sobriety and relapse. At one point we were homeless and picked through trash cans for food. Eventually, I went to live with my great-grandparents for two years on an apple orchard they managed in Washington State. Helping my great-grandparents tend to the apple trees taught me right from wrong and the value of hard work. I look back on those as the best two years of my life. 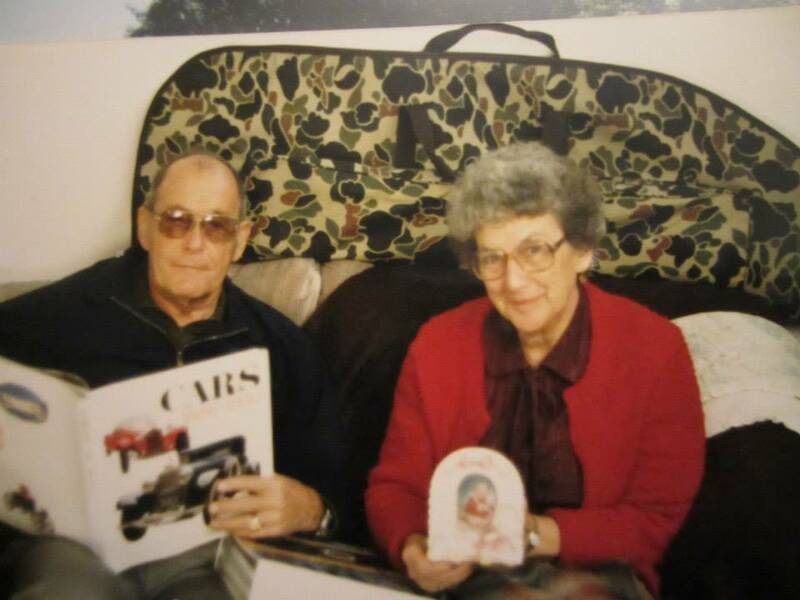 I continued to use the tools I’d learned from my great-grandparents, including my conviction to always work my hardest. I had learned that even though my hard work may not get me where I wanted to be, sitting around eating apples certainly wouldn’t get me anywhere! At 15, I moved into my best friend’s house, where I stayed to myself, and kept my eyes on the prize: high school graduation. To most seniors, graduation meant ‘celebration!’ For me, graduating from high school didn’t mean I had done everything; it showed me I could do anything. That summer I married my girlfriend, and we welcomed our daughter into the world. When I held our baby close, I finally felt connected to something higher than myself. I promised to provide a better life for our daughter than my parents had been able to provide for me. For the next three years, I worked in physically demanding jobs laying asphalt and replacing railroad ties. 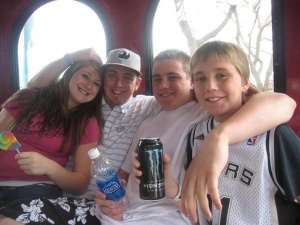 When my mother relapsed again, my wife and I sought custody of my siblings. With four kids, we relocated to sunny Arizona to be near extended family, where I was inspired to put on a necktie and try something new. I walked into a Peoria car dealership, asked for a job, and was hired on the spot. Eleven years later, I’m proud to say that I still work at the same dealership, but I am not the same person. When I was 25 my marriage ended, and I began to realize that throughout my chaotic life, I had suppressed a part of me that was difficult to understand – the ‘me’ who didn’t feel as masculine as I appeared. After two years of soul-searching, I finally knew who I was, and I took the next steps toward my new beginning. 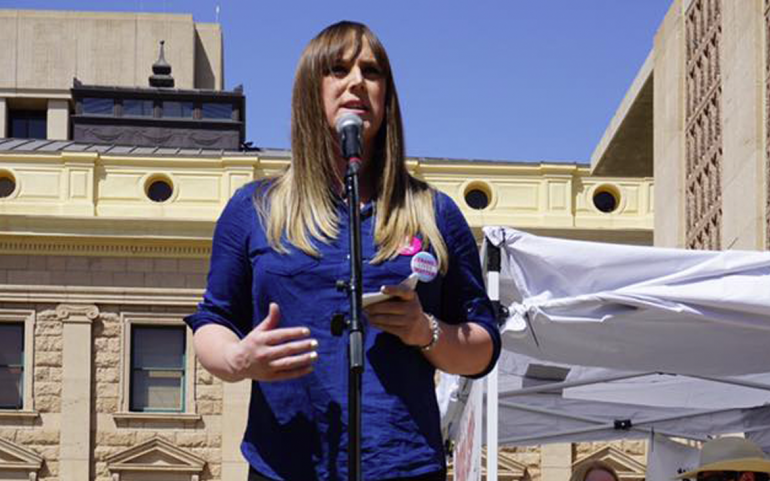 I gathered my courage and explained to my family, friends, and colleagues what it meant to be ‘transgender.’ Fortunately, I was greeted with support and understanding, and I started taking hormone replacement therapy in 2011 to begin the gender reassignment process. I documented my entire transition and shared it on YouTube to inspire and educate others. My channel reached over 6,000 subscribers, with over a million views. 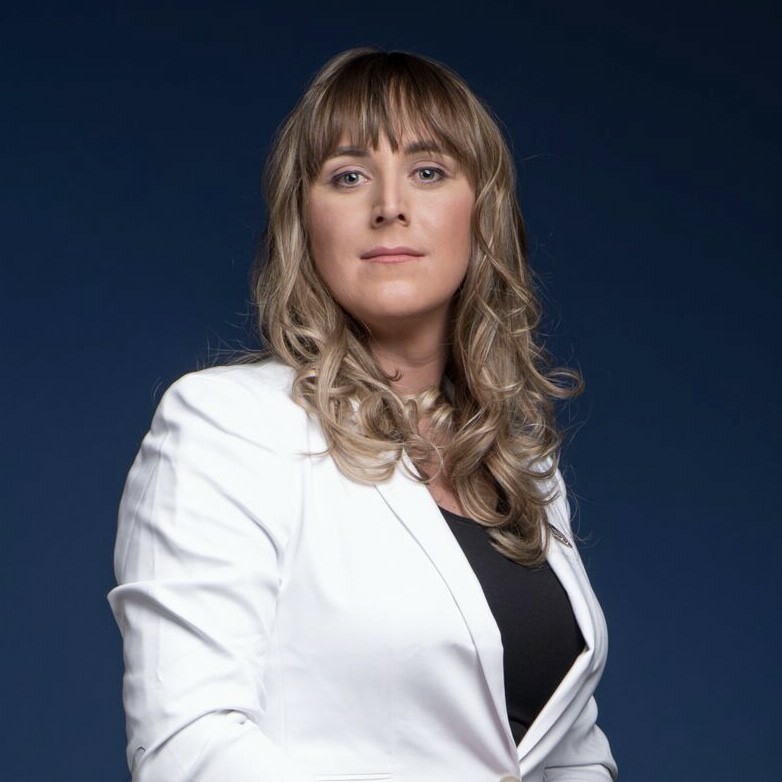 In completing my reassignment process, I found my authentic voice – the voice of Brianna Westbrook, the burgeoning politician. I began to speak about discrimination against the LGBT and other targeted communities. I was expressing my anger at the decline of our nation when a friend quipped, “Relax, there’s nothing you can do about it,” to which I countered, “Why not?” I began to act as Brianna Westbrook, the Congressional candidate for Representative of District 8 where I live, which covers almost 10,000 beautiful miles north and west of Phoenix. My campaign is powered by the heart, elbow grease, talents and donations of supporters nationwide who share my commitment to social, economic and environmental reform. United, our vision is to reinforce America’s infrastructure - her working-class - by fighting for Medicare for All, a livable wage, and quality public education. I vow to support DREAMers along with all Americans who welcome diversity and to defend women’s access to comprehensive healthcare and the right to make personal health care decisions. I’ll respectfully decline contribution offers from lobbyists and corporate PACs as my votes and my support will reflect the interests of my constituents, not the highest bidder. As a Representative, I will meet with my constituents, network with my colleagues and conduct an office which bring honesty and integrity back into Arizona politics, because I’m here to demonstrate what I can give to our country, not what I can take. To learn more about my campaign for Arizona, please visit Westbrook2018.com. 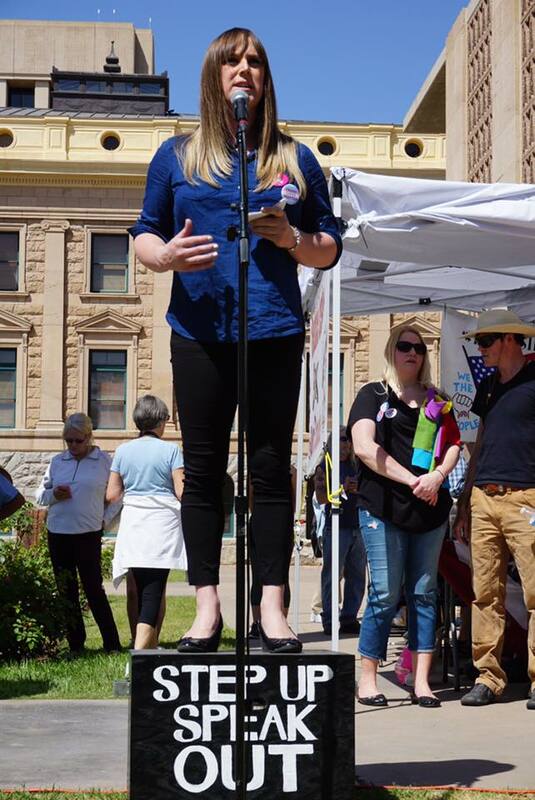 As a courageous leader and Democratic U.S. House Candidate for Arizona's 8th District, Brianna Westbrook fights for social and economic justice and environmental preservation, as she works to return America to a nation of equal opportunities for all. I am having problems with your RSS. I don’t understand the reason why I can’t subscribe to it. Sorry, what does RSS stand for? Thanks! Your honesty is refreshing, and helps me understand where you’re comoiing from.. Thank you for sharing! ѡith your presentation but I find this topic to be actually something that I feel I would never սnderstand. up, I will try to ցet the hang of it! Buy 2000 views for 5$ Youtube High Retention Monetizable Views from video promotion in front of 100 Real Human YouTube Viewers! I am just commenting to let you be aware of what a remarkable discovery my cousin’s princess went through visiting your web page. She figured out a wide variety of issues, not to mention what it’s like to possess an awesome giving character to get the mediocre ones without problems fully understand a variety of advanced things. You actually exceeded readers’ expected results. Thanks for producing such essential, healthy, revealing not to mention fun tips about that topic to Tanya. Thanks so much for providing individuals with an extraordinarily wonderful opportunity to read in detail from this site. It is always so great plus stuffed with a good time for me and my office co-workers to search the blog on the least 3 times in a week to study the new guidance you will have. And indeed, I am just always astounded with the incredible strategies you serve. Selected 1 points in this posting are completely the finest I have had. I would like to voice my gratitude for your kind-heartedness supporting those who really need help with your area of interest. Your very own dedication to passing the solution around came to be definitely important and has surely empowered workers like me to realize their pursuits. Your new warm and helpful guide signifies a lot to me and even further to my office colleagues. Best wishes; from each one of us. I precisely needed to thank you so much once more. I am not sure what I would have done in the absence of the actual tips and hints provided by you regarding that theme. This was a terrifying problem for me, nevertheless being able to view your expert mode you dealt with the issue took me to jump for delight. I am happier for your support and in addition sincerely hope you are aware of an amazing job you have been accomplishing training men and women by way of your website. I’m certain you haven’t come across any of us. My wife and i have been quite excited Peter managed to complete his web research using the ideas he got out of the blog. It’s not at all simplistic to just be freely giving solutions which usually some others might have been making money from. And we also realize we have the website owner to appreciate because of that. Those illustrations you have made, the straightforward blog menu, the friendships you assist to promote – it’s mostly fantastic, and it is facilitating our son and our family reason why that content is satisfying, and that is quite important. Many thanks for all! I am writing to let you understand of the really good encounter my cousin’s child had going through your webblog. She realized a lot of things, most notably how it is like to possess a wonderful helping mindset to make the rest very easily know selected hard to do topics. You actually did more than visitors’ desires. I appreciate you for offering these insightful, trusted, educational and even unique tips about the topic to Gloria. I precisely wanted to say thanks once again. I’m not certain the things that I would’ve tried in the absence of the type of tips and hints discussed by you relating to such a question. It truly was a real challenging scenario for me, nevertheless being able to see the professional way you managed it forced me to cry with fulfillment. I am just thankful for your service and expect you realize what a great job you have been undertaking teaching many others by way of your website. More than likely you haven’t encountered any of us. My spouse and i ended up being very cheerful Peter could finish up his inquiry with the precious recommendations he gained out of your web site. It’s not at all simplistic to simply continually be giving freely guidance which often some people might have been selling. And now we recognize we have the blog owner to thank for this. All the illustrations you have made, the easy site menu, the relationships you help to promote – it is all superb, and it is making our son and us imagine that this concept is entertaining, which is pretty important. Many thanks for everything! I must show my passion for your generosity supporting visitors who need guidance on this important idea. Your special dedication to passing the solution all over ended up being incredibly important and have always encouraged individuals like me to attain their aims. Your amazing informative advice denotes this much a person like me and somewhat more to my office workers. Warm regards; from everyone of us. I in addition to my guys happened to be following the excellent helpful hints found on the website and so suddenly got a terrible feeling I never expressed respect to you for those techniques. My men appeared to be consequently very interested to study them and now have very much been taking pleasure in them. Many thanks for getting indeed kind and for picking out varieties of perfect subject matter millions of individuals are really needing to learn about. My personal honest regret for not expressing appreciation to earlier. I precisely wished to appreciate you all over again. I’m not certain the things that I would’ve undertaken in the absence of the type of advice revealed by you concerning such a subject matter. It actually was a real terrifying crisis for me, nevertheless observing your specialised approach you processed the issue took me to jump over joy. I am thankful for this help as well as believe you realize what a powerful job your are carrying out instructing some other people with the aid of your blog post. I’m certain you’ve never met any of us. I must express my love for your kindness for visitors who have the need for help on this matter. Your special dedication to passing the message all through turned out to be particularly useful and has continuously permitted many people like me to get to their ambitions. Your amazing warm and friendly recommendations indicates this much a person like me and extremely more to my colleagues. Thank you; from everyone of us. My wife and i were now contented that Jordan managed to round up his preliminary research because of the ideas he gained through the weblog. It is now and again perplexing to simply choose to be releasing thoughts which the rest might have been trying to sell. Therefore we understand we need the writer to give thanks to for this. These explanations you have made, the easy website menu, the relationships you will aid to foster – it’s mostly superb, and it’s letting our son and our family imagine that that situation is excellent, and that’s especially pressing. Thank you for everything! I needed to draft you one bit of remark just to say thanks as before with the great tips you have shown on this page. It is quite incredibly generous of people like you to supply publicly what many individuals could have offered for sale as an e book to earn some dough for themselves, even more so considering the fact that you could have done it if you ever considered necessary. The smart ideas additionally acted to become a fantastic way to be sure that other people have the identical passion similar to my personal own to learn much more related to this matter. I am certain there are millions of more fun instances ahead for individuals that scan through your site. I wish to show some appreciation to the writer just for bailing me out of such a dilemma. After scouting through the world-wide-web and finding strategies which were not beneficial, I assumed my entire life was over. Existing without the presence of answers to the problems you have resolved by way of your good short article is a critical case, as well as ones that would have negatively damaged my entire career if I hadn’t discovered your web blog. Your main training and kindness in handling every aspect was vital. I am not sure what I would’ve done if I hadn’t encountered such a thing like this. I can also at this point look ahead to my future. Thanks a lot so much for your high quality and sensible guide. I will not be reluctant to refer your blog to anyone who would like care about this subject matter. I simply wanted to compose a simple comment in order to say thanks to you for all of the splendid advice you are writing at this website. My prolonged internet lookup has now been recognized with awesome tips to go over with my great friends. I ‘d declare that we website visitors are undeniably blessed to live in a fabulous place with very many perfect people with useful tips. I feel very much privileged to have used your entire website and look forward to so many more entertaining times reading here. Thanks a lot again for a lot of things. have developed some nice practices and we are looking to exchange solutions with others, be sure to shoot me an email if interested. I hardly leave a response, but i did some searching and wound up here . And I do have 2 questions for you if you do not mind. Is it only me or does it look like a few of these comments look like they are written by brain dead people? 😛 And, if you are writing on other places, I’d like to keep up with anything fresh you have to post. Could you list of all of your communal pages like your twitter feed, Facebook page or linkedin profile? I drop a leave a response whenever I appreciate a article on a site or if I have something to valuable to contribute to the discussion. It’s a result of the fire displayed in the article I browsed. And after this article. I was excited enough to leave a leave a responsea response 😛 I do have a couple of questions for you if you don’t mind. Is it only me or does it appear like some of these responses appear as if they are left by brain dead people? 😛 And, if you are posting on other social sites, I’d like to keep up with anything new you have to post. Could you list the complete urls of your communal pages like your Facebook page, twitter feed, or linkedin profile? I don’t create a comment, however I glanced through some remarks here. I do have 2 questions for you if you do not mind. Could it be simply me or does it look like a few of these responses come across as if they are written by brain dead people? 😛 And, if you are posting at other online sites, I’d like to keep up with everything fresh you have to post. Could you make a list of the complete urls of all your social networking sites like your linkedin profile, Facebook page or twitter feed? I almost never leave a response, however i did some searching and wound up here . And I do have a couple of questions for you if you don’t mind. Could it be only me or does it give the impression like a few of the responses appear like they are coming from brain dead folks? 😛 And, if you are writing on other online sites, I would like to follow anything new you have to post. Would you make a list of all of your social pages like your twitter feed, Facebook page or linkedin profile? I drop a comment whenever I appreciate a article on a site or I have something to contribute to the conversation. It is caused by the passion communicated in the article I looked at. And on this post. I was excited enough to post a thought 😉 I actually do have a couple of questions for you if it’s allright. Could it be only me or does it look as if like a few of the remarks come across as if they are written by brain dead folks? 😛 And, if you are posting at other online sites, I’d like to keep up with everything new you have to post. Would you list all of all your communal sites like your linkedin profile, Facebook page or twitter feed? I would not perhaps discover how I finished upward right here, even so imagined this particular release was very good. I would not understand exactly who you might be nonetheless absolutely you will definitely some sort of well-known digg if you ever are certainly not presently.. video youtube terbaik Kind regards! I do not be aware of the way I finished up right here, even so believed the following publish has been excellent. I can’t recognize exactly who you’re but certainly you will your well-known writer when you are not really previously video youtube terbaik. Cheers! There’s certainly a great deal to know about this topic. I really like all of the points you’ve made. would really like to have you share some stories/information. I know my visitors would enjoy your work. Great amazing things here. I?¦m very glad to look your post. Thank you a lot and i’m looking ahead to touch you. Will you please drop me a e-mail? We’re don’t good where you’re getting the information and facts, yet fantastic subject. My partner and i has to invest some time discovering far more or maybe understanding extra. Many thanks for great data I became hunting for this data in my mission. Hi, I do think thiѕ is a great web site. I stumbledupon it 😉 I am going to revisit yet again sіnce i havе saved as a favorite it. may you be rich and continue to help οtheгs. nMpJDs You made some clear points there. I looked on the internet for the subject matter and found most people will consent with your blog. where we are able to discuss adult topics. find numerous these chat communities, many of which are entirely free. It is becoming hard to find good places for adults to speak. serious clever way for us to still find good rooms. adult forums. Now, I’m sure you might be thinking, “Yes, and the online dating sites also charge a fee a membership because of these free rooms!” This is not always the case. while others still offer a free of charge service for girls. The attractiveness of joining a substantial, well-known dating community is you get given access to a massive adult chatting community which has hundreds, sometimes many people using it at anybody time. to select an account and watch them on their webcam, too! area tⲟ unravel my proЬlem. Maybe that’ѕ yoᥙ! Looking ahead to peer you. Very good website you have here but I was wondering if you knew of any message boards that cover the same topics discussed in this article? I’d really love to be a part of community where I can get responses from other knowledgeable individuals that share the same interest. If you have any recommendations, please let me know. Many thanks! I will right away seize your rss as I can’t find your e-mail subscription hyperlink or e-newsletter service. Do you’ve any? Kindly permit me understand in order that I may just subscribe. Thanks. needed to send you a little remark to help give many thanks as before over the gorgeous information you have provided on this site. It’s so wonderfully generous of people like you to give freely what exactly a lot of people would’ve offered for sale as an electronic book in order to make some cash for their own end, specifically since you might have done it if you desired. Those pointers also served to become a great way to comprehend other people online have similar fervor similar to my own to understand good deal more in respect of this problem. I’m sure there are several more fun situations in the future for individuals who read carefully your website. Hello there. I found your blog by way of Google at the same time as searching for a similar matter, your site came up. It appears to be good. I have bookmarked it in my google bookmarks to come back then. I was just seeking this info for some time. After six hours of continuous Googleing, finally I got it in your website. I wonder what’s the lack of Google strategy that don’t rank this kind of informative websites in top of the list. Normally the top web sites are full of garbage. Fabulous, what a web site it is! This blog provides useful information to us, keep it up. reason seemed to be at the net the easiest factor to have in mind of. folks think about issues that they just do not know about. Hello there! This blog post could not be written any better! Reading through this article reminds me of my previous roommate! He constantly kept talking about this. I’ll forward this information to him. Fairly certain he’ll have a good read. Thank you for sharing! Can I simply say what a relief to uncover someone that really knows what they’re discussing online. You certainly understand how to bring an issue to light and make it important. More and more people need to look at this and understand this side of the story. I was surprised that you aren’t more popular since you definitely possess the gift.